Read the first chapter of this novel here. Most of you who've hung around the blog for awhile know how fond I am of the idea of collaboration -- it's always amazing to me to read about and hear about how authors interact as separate individuals to produce a single work. Danielle Ackley-McPhail is an editor and writer with six novels, and one writer's guide to her credit, as well as editing seven and contributing to fifty short story anthologies. Editor Danielle, while pulling together a forthcoming fairytale anthology called GRIMM & GASLIGHT *cough* GASLIGHT & GRIM (sorry, Danielle), wanted to include a retelling of "Ali Baba and the Forty Thieves," and so arranged with a friend, Day Al-Mohamed, to be her cultural and ethnic adviser, since Day was born in Bahrain and could help her American-born friend to "get it right." Day was so enthused that Danielle eventually asked her to be a full collaborator and co-author. This is Day's first novel. SUMMARY: You know the story from the original translation of 1001 Nights, Ali Baba and the Forty Thieves. If not, a quick summary: two brothers, Cassim and Ali split an inheritance; one lives large, the other lives small. Ali one day sees a large tribe of thieves open a magical cavern in which a treasure is secreted. Ali imitates their "Open, O Simsim!" and opens the cavern and then takes out bags of gold pieces. Through the usual no-one-can-keep-a-secret ridiculousness, Cassim's wife finds out, Ali reveals all, and Cassim goes to take treasure - but forgets the magic word and is caught by the band of thieves. They do away with him, Ali has to retrieve his body and in order not to cause suspicion, they bury him in secret... but again, a secret is only something one person knows. In the fairy-tale turn of events, someone brags about sewing a body back together, and the thieves come looking for Ali and his household. Through trickery and relying on the Middle Eastern hospitality inherent in the entire Arab community, the thieves get inside Ali's compound, hidden in huge oil jars. A slave girl discovers that there's the Arabic version of the Trojan Horse going on, and takes care of them fatally - and Ali honors her by giving her freedom. The last thief this same girl manages to off during a dance for her master, and Ali is so grateful he marries her to his son, as the highest honor. Since this story is known - at least since the 1700's - there can hardly be said to be spoilers. But! If I tell you the twists and turns and differences in the retelling, there WILL be spoilers, so... I won't. Instead I'll mention Victorian England! Steampunk! Airships and Adventure! Charles Babbage! 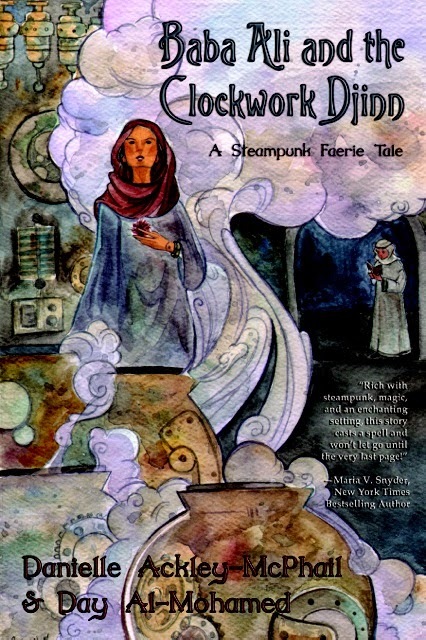 Dastardly thieves, magical puzzle-boxes, enigmatic djinns and mechanical birds...!!! Isn't that enough to whet your curiosity? This is a richly-detailed, fascinating and wonderfully adventurous novel. You'll enjoy the heck out of this - and reading it aloud will be even better. PEAKS: Baba (the name is an honorific) Ali is a student at the beginning of the novel -- young and unsure of many things, but he's DEFINITE about his faith. His belief is rock-solid, and his every response is tempered through the lens of his belief. For Americans who rarely have a positive picture of the Muslim faith, this is a gift, and additionally would make me consider this a positive read for religious parents seeking fun fiction for their young adults. Keeping in mind that it's still a fairy tale, the novel has a lot to offer on a number of levels. Though the tale of Ali Baba was added to the original Arabic translation of 1001 Nights by one of its European translators, Antoine Galland, he may have heard it orally in Syria, while another theory has it to be of Cypriot origin. Regardless, the way the authors spun the tale as belonging to the Arab world works beautifully. And, did I mention the appearance of CHARLES FREAKIN' BABBAGE!? The philosophical discussions of faith and science are amazing -- really well done. I truly enjoyed imagining conversing with this great man. And, of course, there was food -- dates, olives, fruit, oils, spices... *sigh* This novel has such wonderful diversity and this exploration of the Arabic culture is pure fun. There are richly detailed historically accurate outfits, gender roles, courtesies and conversations. While taking strength from the foundation story, this tale stands on its own. It is just a gem to read, and those fond of the original tale will have a ball. This novel also contains a love story - one that sneaks up on the characters, which is the furthest thing from insta-love that there could be. Huzzah. VALLEYS: There just aren't really valleys here. While the pacing slows a bit in the middle, I find the sense of urgency, danger, and threat begins early and builds throughout the novel. The language may be richer than many readers are accustomed to, but I found it truly beautiful - and while not a quick read, a really charming one! The only tiny quibble I had in the novel is that there are two djinns... but we don't explore what went wrong in their relationship, WHY they are enemies, and really what drives the one we know best to be who she is ... I tend to have a lot of "reader greed," but this seems to be a tiny spot that was overlooked in an otherwise tightly plotted and well-polished novel. NB: This isn't Disney's version with a beloved, wise-cracking blue djinn and rousing choruses of "Arabian Nights," not by any means. (Though that song IS stuck in your head now, isn't it? My bad.) This novel is a.) a crossover, and will be enjoyed by adults, and b.) isn't really appropriate for the squeamish, as it hews much more closely to the original tale. There's death - violent, gory death, just like in most original fairy tales. Enjoy responsibly. Do not read while driving heavy machinery. Your mileage may vary, etc. BONUS: Here's a fun interview where Danielle and Day talk about what each of them brought to the table in this collaboration on this book; Danielle discusses her control issues and Day her random enthusiasms for chopping up protagonists...no, really. DOUBLE POINTS: I've decided to recommend this book to my peeps on the A MORE DIVERSE UNIVERSE list this year. This group challenges each other to read one book written by an artist of color the last two weeks in September (I kind of fudged on that), and share that book with the group. Just one. Together, we become the change we want to see. Thanks, Aarti. I received a copy of this book courtesy Palomino Press, the young adult imprint Dark Quest Books, via NetGalley. You can find BABA ALI AND THE CLOCKWORK DJINN by Danielle Ackey-McPhail & Day Al-Mohamed online, or at an independent bookstore near you! Thanks so much! So glad you enjoyed it. I must admit, we had a blast writing it. I love that you captured some of the history in the review! I also wanted to highlight that I posted a few "book secrets" that talk about some of the behind-the-scenes pieces of the book that might be fun for people. @Day: !!!!!! LOVED this book, and dragged Tech Boy into reading it, too. Well done, and here's hoping for more diversity in fairy tales and more Arab-universe fantasy and steampunk from you very, very soon! This sounds amazing!! Just reading the review of this makes me feel inspired, really--what a fantastic basis for a folk tale retelling. Thank you so very much. Can't tell you how glad we are you enjoyed the book. And all the effort you went to not just to give an in-depth review but to also draw on our interviews and such. I am humbled and motivated by this. Sometimes we wonder if anyone is getting what we write and your enthusiasm has bolstered my confidence. @ Sarah: I immediately thought you'd love this one. @Danielle: One of the biggest things that the #WeNeedDiverseBooks crew has taught me is the power of the positive word. I'm really happy to boost the signal on a great novel like this one, and again, thank you so much for not only loving the original enough to retell it, but for asking an informed friend to help you get the details down. That shows a dedication to craft that too few people possess. I so look forward to more fresh and diverse takes on traditional tales from you guys - can't wait to read GRIM & GASLIGHT! @Danielle: Um... *cough* Yes, that. I meant that. I also corrected it in the post (!). Tanita, I saw your plea for help with the Mr. Linky and I have taken care of it for you :-) Thank you so much for participating in the A More Diverse Universe tour! I know that your own books were very popular with readers this time around. I LOVE fairy tale/folktale retellings and am thrilled that this one is out there. I will absolutely look for it! If you like The Goose Girl, I also highly recommend Thorn, by Intisar Khanani. And, just saw that you already read Thorn! And (blush) are probably the reason that *I* even heard about Thorn and read it. So thank you! @ Aarti: I never remember who told me about what book! Anyway, this is a good reminder to check and see what Intisar has written lately!! Color Me Excited--It's Cybils Season Again!